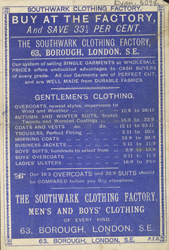 This leaflet, which Evanion dated 16 October 1882, advertises the autumn and winter range of ready-to-wear clothing produced by the Southwark Clothing Factory. While the upper classes still preferred to employ tailors and have their clothes individually made-to-measure, the middle classes enjoyed the opportunity such outlets presented to buy a variety of garments at more affordable prices. These businesses were often very successful as they could offer garments "of perfect cut", "well-made from durable fabrics" and at a competitive price. Perhaps as a final incentive to buy, the Southwark Clothing Factory also reminds its customers that any article which is "not approved" may be exchanged or the money returned.